When 15-year-old Lucas Swain meets 75-year old Violet Park, he feels an instant spark. Even though he has nothing in common with the elderly lady, it's like destiny has brought them together. He also gets the feeling that Violet's trying to tell him something, that she can't rest until she communicates it to him. The only problem? Violet Park died 18 months ago. The vibes Lucas feels are coming from her urn, which is gathering dust on the shelf of a minicab office in London. Lucas has always been odd - he mumbles to himself and dresses in his father's old suits - but he's not crazy. He doesn't just go around talking to dead people and corpses don't usually start up conversations with him. Still, he can't deny the bond he feels with Violet. It's so powerful that he steals her urn, probes Violet's past, even visits the home where she used to live. When his obsession with the dead woman leads Lucas to a real, live connection between her and his missing father, he begins to think his crazy quest might not be so insane after all. He's been after the truth behind his father's disappearance for 6 years - now, it looks like Violet's going to help him find it. The only question is: Does he want to know the truth? And can he trust the voice of a dead woman to lead him to it? 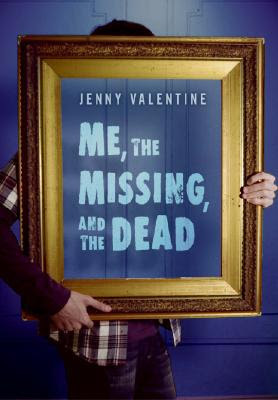 Me, the Missing, and the Dead by Jenny Valentine is a quirky book that's hard to define. It's not quite paranormal, but it's not entirely realistic either. I guess it's just its own thing. Unique and funny, the story is about grief, truth, and navigating one's own way through life's little messes. As unconventional as the novel is, I found it entirely appealing. The only thing that bugged me was Lucas' constant, casual references to using marijuana. It irritated me not only because I'm against illegal drug use, but also because the weed mentions seemed to be thrown in as an afterthought to make Lucas seem more relatable to teens. Ridiculous. Lucas Swain's voice is one of the most authentic I've encountered in recent YA literature. Other than that minor annoyance, I adored this funny little book about a boy, a ghost and a wacky, but poignant search for the truth. To the FTC, with love: I received a finished copy of Me, the Missing, and the Dead from the generous folks at Harper Teen. Thank you! Sounds pretty good, minus the drug references. Even though I like "clean reads" I don't mind reading about drug use if it's in context, if it makes sense, and adds something to the plot. Same with sexual situations and swearing. But if they're just THERE? Well, that's pretty lame. Great, thoughtful review! Gosh I havent have time to hop around much. Suddenly a lot of things crops up. Sounds really good, but I would also have a problem with the drug mentions. But, thanks for the great review! Happy reading!